The Panama Papers leak has yielded its first criminal indictment in the United States. In 2016, almost 12 million documents from a Panamanian law firm were leaked. The law firm, Mossack Fonesca, focused its business on serving well-heeled clients interested in moving money into offshore tax havens, or laundering money through opaque shell companies in secrecy jurisdictions. In the two years since, the leak informed the world about the global practices of the very rich, governmental elites, and shadowy terrorist and other organizations. Politicians have resigned, celebrities have seen sometimes shady financial dealings exposed, and legislation has been undertaken to address the practices revealed in the papers. In early December, 2018, federal prosecutors unsealed a grand jury indictment that alleges four individuals were involved in wire and tax fraud, money laundering, failure to file an FBAR, and making false statements as the result of a multi-year scheme facilitated at Mossack Fonesca. While moving money into offshore tax havens is not a tax crime, it can become one if the money is not properly reported and necessary taxes paid. This case, brought in the Southern District of New York, names four people in a scheme alleged to have run from 1992 until approximately 2010. The defendant dock is multinational: Dirk Bauer is a German citizen, Ramses Owens is a citizen of Panama, Harald Joachim Von Der Goltz is also a German citizen, and Richard Gaffey is an American. Federal prosecutors allege the quartet formed and managed foreign bank accounts and offshore trusts in the British Virgin Islands, Panama, and other secrecy tax havens. Mr. Gaffey, a partner with the Massachusetts accounting firm Elder, Gaffey & Paine, worked with Mr. Von Der Goltz, who was a client at Mossack Fonesca. Part of the method for creating shell companies included naming the elderly mother of Mr. Von Der Goltz as the owner of the entities. 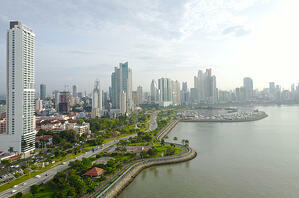 The woman, as a resident of Panama, is not required to pay taxes in the US. Mr. Owens was an attorney at Mossack Fonseca, and Mr. Brauer was an investment advisor at a company that worked with the law firm. At the outset of the indictment, the case appears to hit all the points of the type of case that the IRS has stated it would pursue, in light of its continually shrinking resources. If you have an offshore tax question, a corporate payroll tax issue, or other tax controversy, our tax lawyers can help. At Robert J. Fedor, Esq., LLC, we provide confidential, appropriate solutions to tax problems involving private wealth or corporate assets. Contact us or call 800-579-0997 today.